To Kyle Larson, perhaps the most comforting aspect of his Sunday victory at Michigan International Speedway was the liberation it provided from one of the most frequently-asked questions in the NASCAR Sprint Cup Series garage. 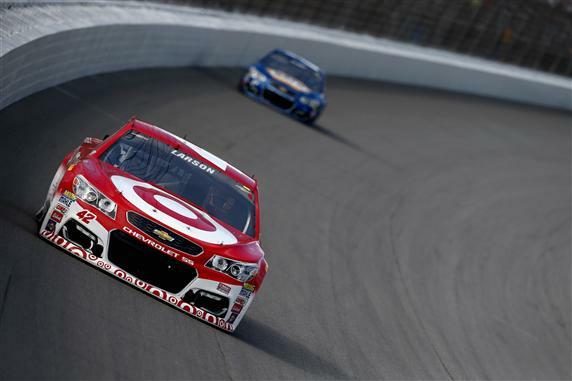 When is Kyle Larson going to win his first Sprint Cup race? That was the query Larson himself invited with a 2014 rookie season that saw him finish second three times. Sunday’s Pure Michigan 400 changed all that. A late caution gave the driver of the No. 42 Chip Ganassi Racing Chevrolet the opportunity to take the green from the front row beside race leader Chase Elliott. Thanks to a shove from Brad Keselowski, Larson cleared the rest of the field through the first corner. Nine laps later, he was finishing off a wild burnout across the checkerboard pattern in Victory Lane. Larson acknowledges he grew frustrated with the inconsistent performances of the 42 team over the past two years, but the recent strength of the Ganassi organization has been a source of substantial encouragement. And the victory validated his optimism. “Our team in the past has been so up and down,” Larson said. “A couple months out of the year, we’ll be really good. Then the next couple we’re bad, and the next couple we’re good again. That gets frustrating. Larson’s victory at Michigan was all the more meaningful because it came just three weeks after close friend Bryan Clauson died from injuries sustained in a midget car accident in Belleville, Kansas. Larson competed in the Knoxville Nationals for winged sprint cars the following week, when NASCAR Camping World Truck Series driver Rico Abreu dedicated his victory in the Aug. 12 “A” main to Clauson’s memory. On Sunday, Larson parked his No. 42 Chevy in Victory Lane and immediately honored his friend and his family. “It’s not that I tried any harder, because I’m always trying my best to win,” Larson said. “But when we did get it, it was that close to Bryan’s passing, and it makes you feel better about the win, and it means more, for sure. In the three days after Michigan, Larson was consumed with celebration and a succession of media obligations. On Wednesday, the entire Ganassi organization convened for a victory lunch. Now, with the win behind him, Larson shifts his focus to the final two regular-season races – at Darlington and Richmond – and to his first appearance as a championship-eligible driver in the Chase for the NASCAR Sprint Cup. “I think we have a good shot,” Larson said. “There are a lot of good tracks for me in the Chase. In each round, I’ve got a track or two that I really enjoy going to, so I’m excited for it. Now, freed from nagging questions about his winless streak, Larson can attack the Chase for real.